The Imo Peoples Action for Democracy (IPAD) has berated the Nigeria Police Force over the attack on innocent Imolites for expressing their freedom to assembly peacefully, says Governor Rochas Okorocha has turned the state into terror zone, reports ITRealms. IPAD in a press statement made available to ITRealms and endorsed by the Coordinator, Mr. Aku Obidinma, Secretary Organizing Committee, Marjorie Ezihe and member, organizing committee, Mr. Chido Onumah, lamented that Imo State has unfortunately become a fascist state where freedom of expression and assembly is no longer guaranteed. They also demanded redeployment of the Police Commissioner, Chris Ezike, insisting he has lost the confidence of the people. “We say this because of the ugly incident that happened this morning where the Imo State government used the police to brutally attack peaceful protesters. We peacefully commenced our protest this morning from Wetheral Road Roundabout in Owerri, Imo State, and were accosted by heavily armed policemen who demanded we stop because the commissioner of police did not approve the rally. “We insisted that we must continue since the law did not say we needed his permission before we could embark on a peaceful protest. As we continued our match, the police descended on us and started beating up the protesters, firing tear gas, confiscated our placards and manhandled even the minors amongst us. “Today is really a sad day for our democracy. Imo State has been turned into a terror zone. Governor Rochas Okorocha is now a full-blown dictator and he has as his accomplice the Imo State Police Commissioner, Mr. Chris Ezike, who is always ready to do his dirty jobs. We are disturbed that the police who ought to protect peaceful protesters are the ones now used to attack law abiding citizens. 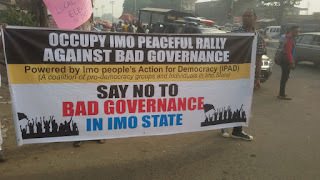 “We wish to inform the government and the police that no amount of intimidation will make us drop our agitation for good governance in Imo State. We will in no distant time mobilize Imolites for a massive protest that will bring the government to its knees. “We use this medium to call on the police authorities and the Presidency to quickly redeploy the Imo State Police Commissioner out of Imo State as he has lost the confidence of the people of the state.